A few days ago my hairdresser, while trimming my hair, exclaimed: Your complexion is flawless. It makes me downright sick with envy. Let's face it: I don't look twenty anymore. But what she meant was: My complexion does look unusually clear, smooth and wrinkle free, especially for someone who's recently hit 60. Time proves: I was indeed correct in writing this (among other things I said in this book). For more than ten years, I have been dedicated to dry-brushing my face every day. You can see my earlier video, From Dry Skin to Glowing Complexion: when I was 52. I got compliments then, and I get them now. Most beauty experts talk about being super gentle with your skin. My method is different, but it works. I say: you need to train your skin to endure, to withstand aging. Experiments show normal cells stop dividing when they touch their neighbors. To speed up the reproduction of new cells, dead cells must be removed. That’s why daily exfoliation makes a world of difference. Dry brushing is the best way to give your skin a youthful glow. Here’s another video, of me dry brushing my skin at age 58: Facial Dry Brushing. 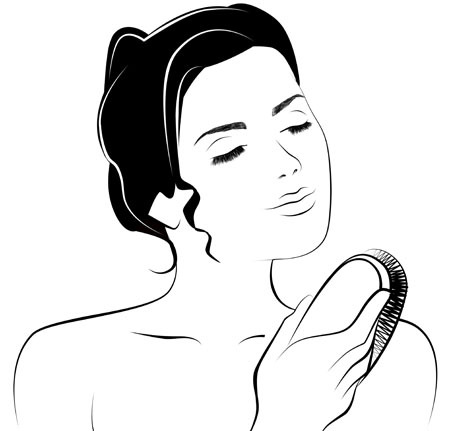 Before you begin dry brushing your face, make sure your skin is completely clean. No skin makeup at all, or you'll regret it. You’ll irritate yourface, rash and red blotches almost guaranteed to follow. Facial dry brushing works! Do try it. With a little time and patience, you’ll be pleased with your smooth and silky skin. Interesting that my hair dresser used the expression “sick with envy.” I did tell her: Envy's a nasty emotion. It can make you—literally, physically—sick. Here’s my advice to you: Take care of your skin. It will make a huge difference how you’ll look in the days to come, as well as you grow older in years. When you get my age or older, most likely other people will still envy you, but at least you’ll free of this corrosive emotion yourself. Q: I’ve been dry-brushing for ten days in a row, and there’s still thick dry skin on my face! 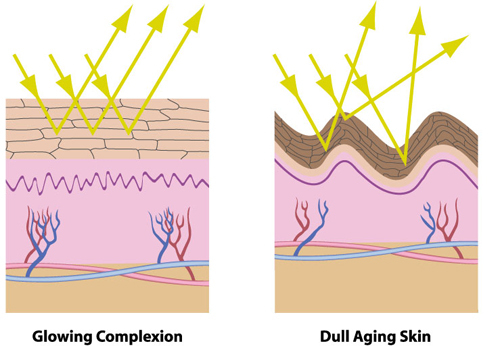 A: Dry skin is a sign there are lots of dead cells. People who haven’t exfoliated well and for a good long time before they start dry brushing will always have this effect. Don’t expect instant results. It took years for that to build up. Surely it’s reasonable to expect it to take weeks, maybe a couple of months, to rid yourself of that hardened, dry skin. Just stick with the program…dry-brush daily…moisturize lavishly. And, as the days and weeks roll by, you skin will become both clearer and blemish free. All it takes is discipline. And patience. Q: What is the difference between your facial dry brush and your other product, called Strigil? A: The effects of the brush and the facial Strigil definitely overlap. 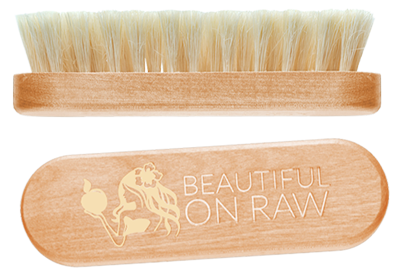 The brush is applied over clean skin and vigorously strips the outer layer of dead cells, providing deep exfoliation. The Strigil offers only light exfoliation and is applied over lavishly moisturized skin, massaging underlying tissues. I developed this tool as a prerequisite for those who have sensitive skin and cannot use the dry brush right away. In time, your skin will get used to these treatments. You’ll be able to use both as well. 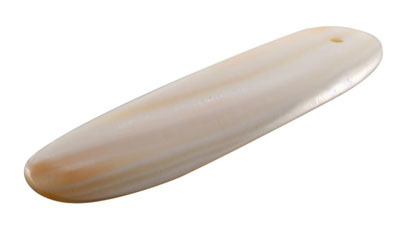 The Strigil tool is best used after cleansing and applying oil or a moisturizer. You will most likely want to avoid using it immediately after dry brushing. That would be an excessive level of exfoliation at one time. Try dividing the practices up. Perhaps use the Strigil in the morning and do your dry brushing at night before bed. I prefer this refining - it works wonderfully for me! However, there are no strict rules. Experiment and develop your own beauty routine, one that suits your skin specifically. rashes on my face after first and second use. Is this a normal thing to happen? A: I understand your concern. But let’s look at what dry brushing really does. It’s about exfoliation. When you first start dry brushing, you might experience some blemishes. Dry brushing doesn’t create those blemishes. Rather, dry brushing dislodges toxins and brings them to the surface, which in turn causes the blemishes to appear. But these usually go away in a week or two. If you continue dry brushing, you’ll usually see a much brighter, clearer complexion. When it comes to natural healing, it’s very common for things to initially get worse before they get better. This is especially true if you had issues with your skin before. 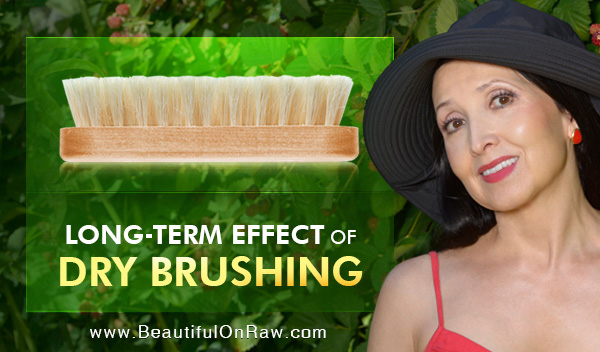 Dry brushing strongly pulls toxins out. This must be an internal issue rather than external. Here is what I suggest: stop dry brushing for now. Begin a practice of daily juicing. Remove all processed food from your diet. Then in 4 weeks try a gentle dry brushing again. I just want to express my gratitude for the face care concept you developed, complete with tools. Strengthening my skin is really working for me. I've been dry brushing & face massaging for only 1 week and I see a big difference! I am actually using the mask removing brush to dry exfoliate. Another key element of having a glowing complexion is daily mask application. Apply a thin layer of the masque to your face. Keep it on for 2 minutes only. Then remove by brushing it off with the masque-removing brush. It’s that simple, but the benefits are numerous. 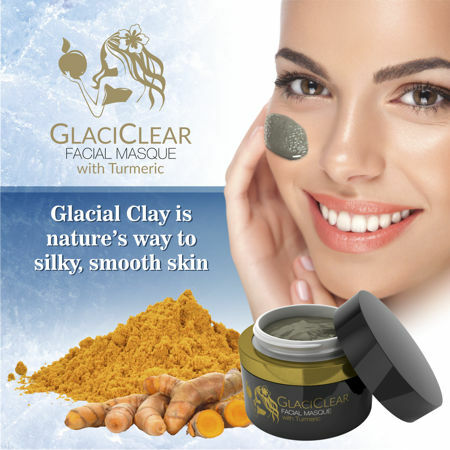 Clearer skin, smaller pores · A masque deep-cleanses your pores, digging out dead facial skin cells, metabolic wastes, and oily residue that can clog those pores. Better hydration · Your masque brings moisture to dry skin, softening your skin, enhancing its elasticity. Easier makeup application · You’ll find it easier and faster to apply makeup on well moisturized skin. Fewer fine lines, a fuller, healthier look · A good facial masque can reduce signs of aging such as fine lines, wrinkles, and brown spots, and give your face a softer, smoother, fuller look and feel. An even skin tone · The right facial masque, regularly applied, reduces hyper-pigmentation and gives you more even skin tone and texture. Improved oxygenation · Every part of your body needs oxygen. Daily masquing promotes sweat-gland secretion so as to increase the skin’s oxygen content. Firmer skin · Masques help enhance collagen production and prevent free radical damage, gradually leading to firmer, tighter, younger-looking skin. If you do nothing else for your skin, do apply your masque first thing in the morning— every morning. In ten years, you’ll be glad you did. Watch my video My "Ageless Face" Morning Skin Toning Routine. Microdermabrasion…derma peels…laser resurfacing... What is better? Exfoliation is your way to beautiful skin.